Springfield PD (8/22/18) - The Pro-Tektor®, Inc.
Springfield Police have a new tool to help keep you safe. Officers call it The Crime Stoppers Kiosk. 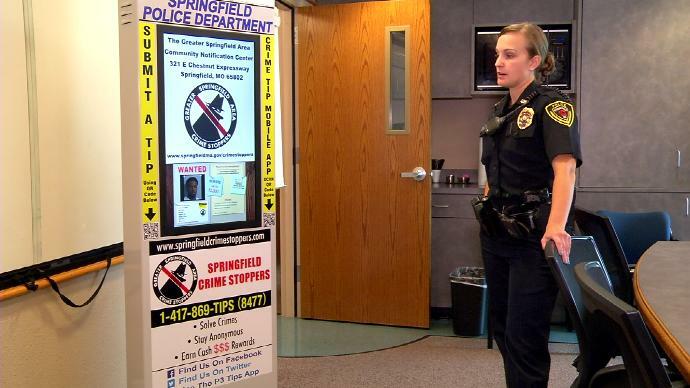 It’s designed to be a one-stop-shop for anything Crime Stoppers-related. The kiosks will display information about wanted fugitives, Amber Alerts, and cold cases. If you want to submit a tip, police say using a kiosk to get started is as simple as pulling out your smart phone. Instead, Kleemann says there are QR codes on the kiosks. Scan them with your phone, and they’ll take you right to the Crime Stoppers website or its tip submission app. “Someone might have some information that could be helpful, and we’re just here to solve crime. We think that this is going to be a great new option to help keep Crime Stoppers at the forefronts of peoples’ minds,” Kleemann says. Springfield City Council recently approved the purchase of the kiosks at a cost of about $20,000 They will be set up at Library Station on N. Kansas, Library Center on S. Campbell, and the Walmarts on E. Kearney and E. Independence.